The connector is from Eastern Beaver and matches exactly the OEM. I've used matching wire colors. 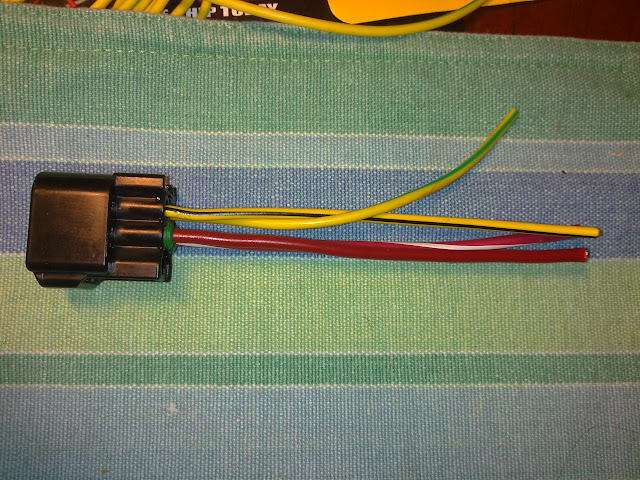 The upgrade: both red wires are 14 gauges. DISCLAIMER: this is a perfect replacement if you were able to salvage your starter relay but your OEM connector is burnt up. BUT I CANNOT GUARANTY 100% fix to the known issue. The connector, by design is made for 16-18 gauge wires which are too small for the amount of current that passes through it from factory setup. 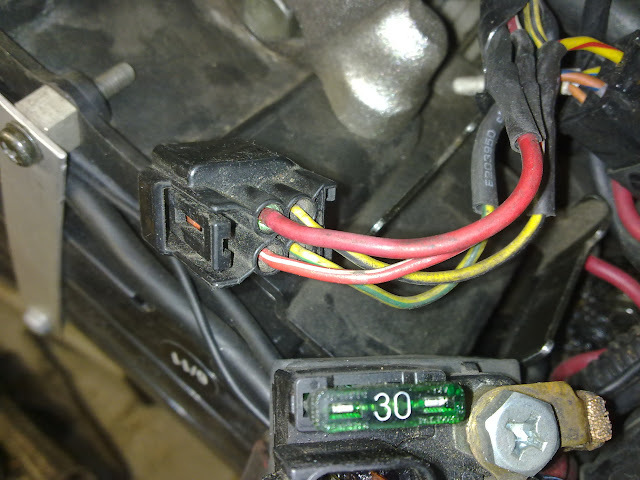 A headlight mod coupled with this connector SHOULD permanently fix the issue. You buy this, you thus agree that it is as if you bought the parts and made it yourself! All that said: Replacement Starter relay connector is $20 shipped (TLP member price! It's $25+shipping on eBay). 2) Connect the new one to the main harness. www.easternbeaver.com buy part number RFW 4P090-Female in the Furukawa Sealed Connectors section. If you want to match wire color, visit: www.brillman.com They might have them. Last edited by Brainless; 09-22-2015, 03:06 PM. Better get 5 or 10 more built up. I'm sure they'll sell throughout the summer. Jd if these guys want the one I claimed go ahead and sell it. I live right down the road all I have to do is show up and bother you I'm sure I can con u into making me another, one of these days. Zach I appreciate it. I'll be making more but it just takes time to get the stuff from Japan! I will have more available. I'll order 5 more plugs Monday. ETC approx 10 days. Thrill: your is in the envelope ready for shipping tomorrow! Sepha: I've ordered 7 more connectors from Japan! One left from the 1st batch. $20 shipped. Second batch will be made sometime end of next week or weekend. Got mine in the mail the other day. Looks like very good quality. I'll be soldering it in on the next rainy day thanks.